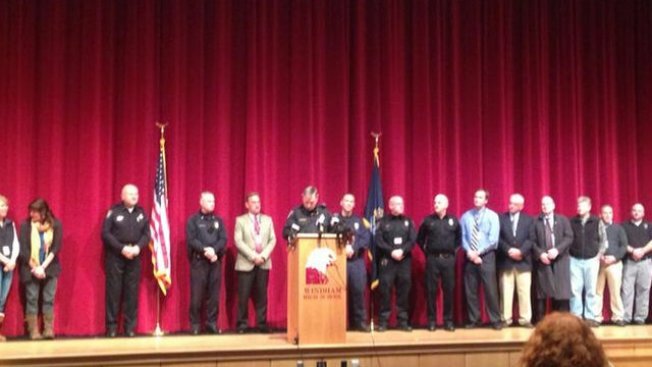 Police have scheduled a news conference for 11 a.m.
Wednesday's press conference in Windham, Maine. A 16-year-old boy has been arrested on eight counts of terrorizing in connection to the threatening emails that have shut down schools in Windham and Raymond, Maine, since Monday. The arrest was announced at an 11 a.m. news conference. The boy, whose name wasn't released, was charged with one count of terrorizing for each school in the district. Police said the teen lives in Windham but is not a current student in the district. The email threats were made to the principal and the superintendent. The specific content of the emails has not been released, but reference was made to the use of a gun. School will resume Thursday. Guidance counselors and police will be on hand in the schools for the rest of the week. The 3,300-student Regional School Unit 14 released all of its students on Monday as police investigated the emailed threats, and the schools have been closed since. They remained closed Wednesday.